At the beginning of this blog, I mentioned how some members of a family are spoken of with fondness and admiration and I mentioned William McDowell. It was also this way with my great-uncle George Holmes Phillips. William was George’s grandfather. I first met Uncle George during a bizarre experience I had when visiting with my grandmother Jane at the age of 14. I was put to bed in “Uncle George’s room”. It was very tiny just like the little house that my grandparents lived in but cozy. The window on my right had the customary blind in the window which would throw the shadow of people wondering through the yard at night. My family was rife with stories of the predations of the local degenerates who passed through looking to steal something. I was a city girl and found the whole situation very nerve-wracking. That coupled with the fact that I was sleeping in Uncle George’s bed left me in a disturbed sleep. I woke up at some time during the night, feeling a hand on my shoulder, and there, at the foot of the bed, stood two men; the faces were clouded but there clothes stood out. One in farm clothes and the other in dress clothes. I was frightened to say the least! Then, I realized there was someone talking or rather having a heated argument in the other room. The shadows disappeared and I crept out to the main part of the house. My grandmother was rummaging around in her bedroom having a real go-round with someone (I assume my grandfather) in a state of dementia, of which I had no idea existed. Eventually, my mother came out and calmed her down. No one ever spoke of it. The brothers appeared again on the second night. I have always wondered what they meant to tell me. But will take it that they would like their story told! In 1905, at the age of 17, school-leaving age, George was put aboard the S.S.Saxonian bound for Boston. He would probably make the rest of the way to Winnipeg, Manitoba by train. Left behind were his two sisters and his brother, Richard. His sister Sophie would not see Canada until 1913, the other, Evelyn would not leave Ireland. He had $31 in his pocket and listed himself as a farm labourer, a definite step down from the life he had known. On the 1906 census of the Prairie Provinces, he was living at a boarding house in Winnipeg. Unfortunately, that census does not state the occupation of the person. In 1907, George returned to Ireland, I assume in relation to Richard coming over. He came back to Canada on the S.S. Caronia, July 24, 1907. A few months later, Richard followed on the maiden voyage of the RMS Lusitania, docking in New York on Sept 14, 1907. The Lusitania was torpedoed by the Germans in 1915, off the coast of Ireland. That was the year my grandparents married. Still, I can’t help but imagine the reaction of my grandfather to the news of the ship going down. He had laboured on farms for 8 years before getting married. In the 1911 Canadian census, George was working in a saw mill on Valdez Island in British Columbia. On the 1916 census, he was with Richard and Jane on their farm in Manitoba, the start of a lifetime of companionship between the three. The couples first son, George Holmes was also listed with them, so you can see the respect that they had for him. It is likely that he helped them in many ways. In 1920, George made an ill-fated attempt at marriage to Dorothy Johnston in Vancouver. She however, was not for the homesteading life so that didn’t last long. He never did remarry.The land in the Lawrence municipality of Manitoba did not lend itself easily to farming so the two brothers took to raising cattle. 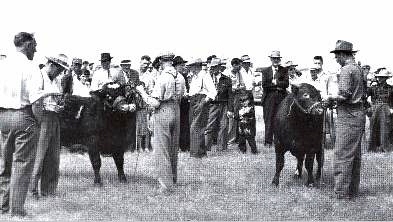 Below a pic of George at a cattle fair in St. Rose du Lac, Manitoba (in the dark suit on the right). Uncle George visited Ireland several times. 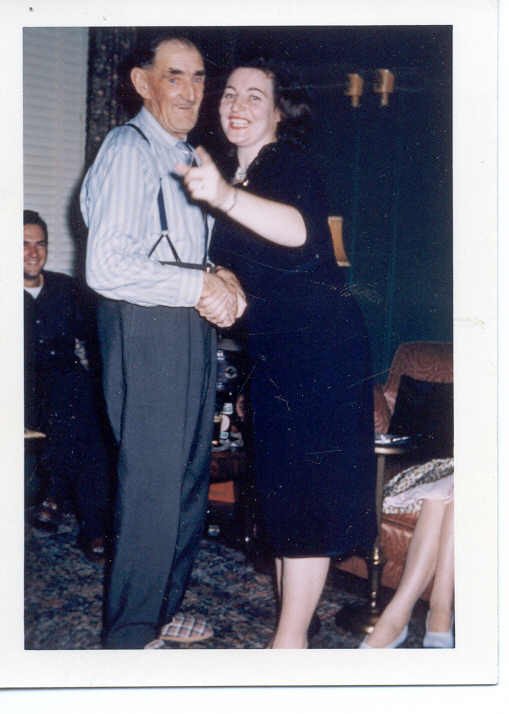 Here he is enjoying a dance with one of the New York relatives in 1960. 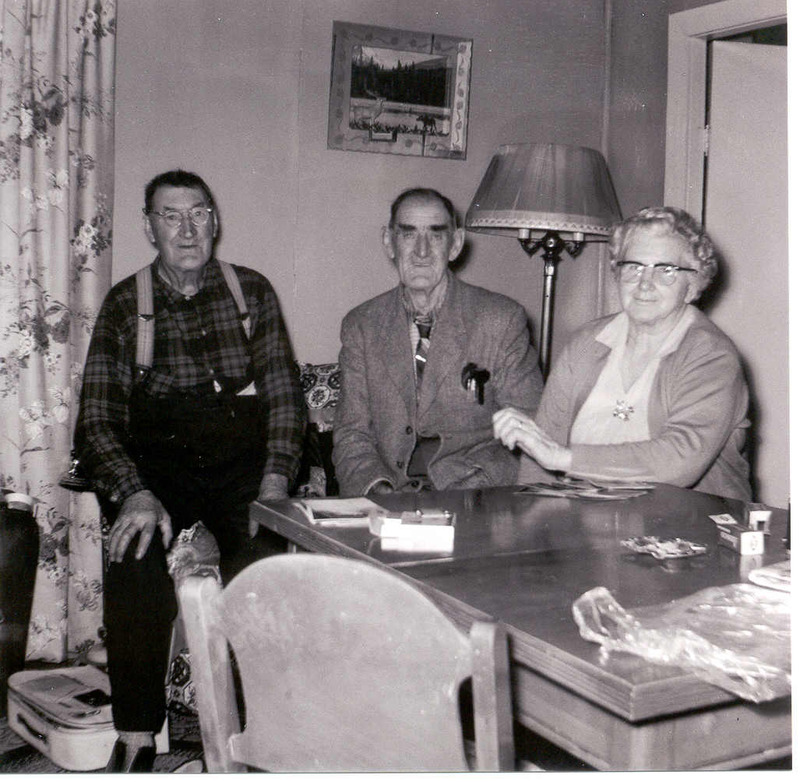 My grandparents had many rough times in the isolated environment they found themselves in and Uncle George seems to have always been there along the way. What they lost in coming to this cold and vast land, they gained in friendship and loyalty. George and his sister Sophie eventually bought neighbouring farms to my grandparents. All this I will go into further along. George is buried in the Magnet Cemetery, Magnet, Manitoba along side of Jane and Richard. Rest in peace, Uncle George. 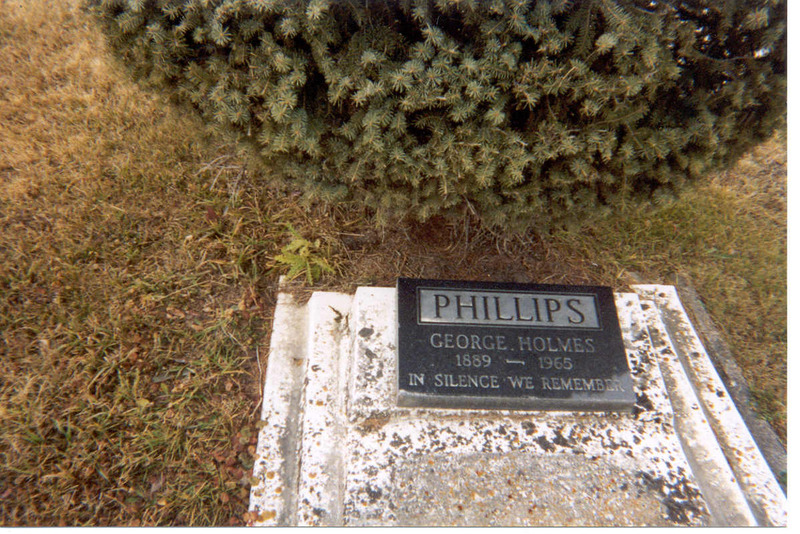 This entry was posted in George Phillips, Ireland, Manitoba, Phillips Family, The Family in Canada and tagged George Holmes Phillips, George Phillips, homesteading, Manitoba by Shamwest. Bookmark the permalink. Has Andre seen that picture of Grandpa Richard? He really reminds me of him! I actually don’t know. If he would read my blog he might. lol! Don’t you hate it when there’s a missing child? Could the child who died young possibly be Wilda Jean Phillips who died 28 Mar 1924 in Neepawa? Hi Jackie! I had thought that at one time but couldn’t make the link. I think there was a prominent family in Neepawa named Phillips at the time and that may have been her. I think I even looked for a death cert. I will have to return to that when I get finished slogging through my Dad’s family.